In April 2005 an excavation was conducted at the northwestern foot of Tel ‘Akko (Permit No. A-4433; map ref. NIG 20828–30/75868–7; OIG 15828–30/25868–7), prior to the installation of a cellular antenna. The excavation, on behalf of the Antiquities Authority with the financial support of Cellcom Company, was directed by H. Abu-‘Uqsa, with the participation of Y. Lavan (administration), H. Tahan (surveying), H. Smithline (photography) and D. Syon (numismatics). The surface level, which was removed by mechanical equipment, contained modern debris. The remains of several tombs were exposed at a depth of 1.6 m (Figs. 1, 2). Tomb 1 was aligned in a northeast-southwest direction; its northern end was not exposed. In Tomb 5, situated in the northeast corner of the square, a skeleton was found in its original position with its head facing east. South of it were two built tombs, Tombs 2 and 3 (0.55 × 1.10 m); one was covered with stones, while all that survived of the other was an outline in which children appeared to be buried. Tomb 4 (0.6 × 0.7 m) was located south of Tomb 1. 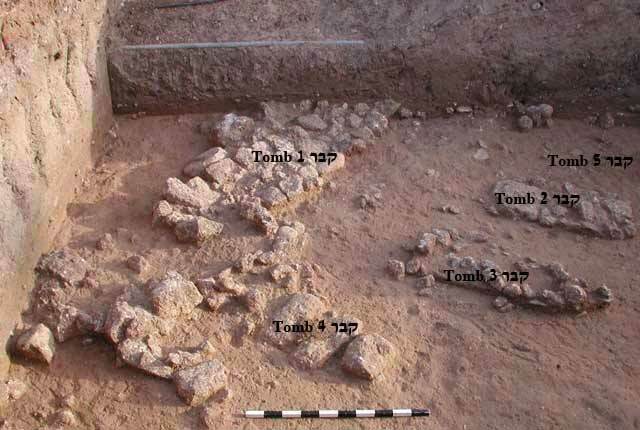 Scattered bones and concentrations of stones that most likely came from tombs which had been damaged were found in the area. Potsherds that were collected from the surface level and the fill are not related to the tombs; most of them date to the Persian and Hellenistic periods while a few are from the Roman and Crusader periods. Four bronze coins were also found: one Hellenistic (third–second centuries BCE; IAA 119529), two Seleucid (Antiochus III, 200–187 BCE, IAA 106194; Antiochus IV, ‘Akko, 175–164 BCE; IAA 106193) and a small cast coin most likely from the Late Roman period (end of the fourth century–beginning of the fifth century CE, IAA 119530). 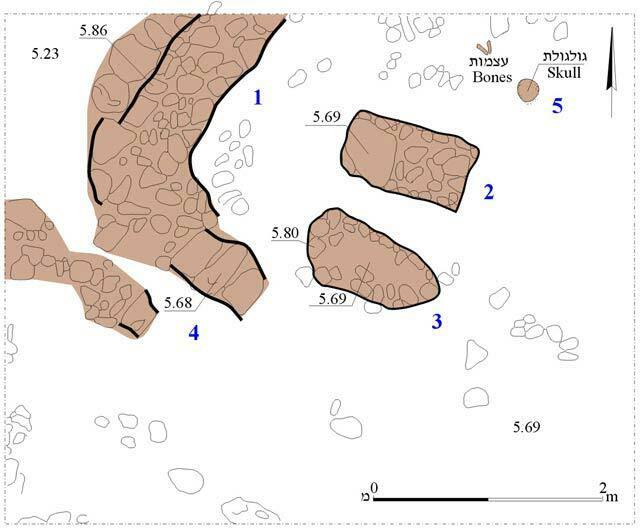 Pit graves and built tombs made of fieldstones or dressed stones were found on nearby Ben-Ami Street and in the underground railroad passage, located c. 15 m north of the current excavation (Permit Nos. A-4063, A-4410). These tombs were similar to those exposed in the current excavation and it seems that all of these tombs belonged to a Roman period cemetery.